No, you cannot participate in your own contest, therefore you cannot win. Since you are hosting and funding it, you cannot particpate in the contest or win. You are merely hosting a contest for other Troopers. im confused... what would the person doing the contest get out of this? just scales? 2) If approved, that amount will be withdrawn from their TT account on a balance that exceeds $20. 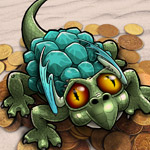 3) TreasureTrooper will match each prize dollar with 1 dragon scale ($5 would equal 5 scales, etc). 6) Member will let Nikkums know who the winners of their contest is, and what amount of cash needs to be dispersed to each. 7) We will add the winnings directly into the winners' accounts! The person who is hosting the contest is giving up the prize money, via his/her TT balance and TT will then match dollar for scale. Winnings will be deposited into the winners' accounts. will the person hosting the contest get anything out of it? if i host contest for $20, do i get anything back? in other words i may as well just give it mabutu to feed his family. Edited by wayney1233, 22 May 2013 - 07:22 PM. You can donate to Mabutu if you like. However, this host your own contest allows you to directly run a contest you think other members would enjoy. Not so long ago, members use to host contests for other members all the time and award the winners via PayPal. Now, with this new option implemented, they can simply just award members with the earnings from their TT account, directly in to the members TT account, with the added bonus of a few scales. You don't get anything in return for hosting a contest other then the satisfaction of knowing that other members will be thankful for you taking the time to plan, host, and fund a contest that they get to participate in.